Viper came from the F-16’s resemblance to a snake when seen from head-on in the landing attitude. Great fighter aircraft need great pilots, and great pilots acquire their highly specialized skills through intense training at Luke Air Force Base, just west of Phoenix, Arizona, home of the 56th Fighter Wing of the USAF’s Air Education and Training Command. Many hours of hard work are necessary to mold young pilots into Viper Drivers, a special designation that sets them apart from other fighter pilots. From the rigors of training to the excitement of combat, Lt. Col. Robert “Cricket” Renner, USAF (Ret. 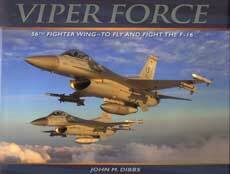 ), captures the lives of the Viper Drivers in their own words and alongside the amazing air-to-air photography of John M. Dibbs.